Hearing loss can come with old age but there are some preventative measures you can take. If you have a loved one that is suffering from hearing loss, it can be difficult to know when they may need help. However, if you find telephone conversations difficult because they can’t hear you, or you go for a visit and can’t hear over the television, they definitely need some help. 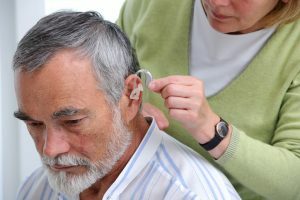 If you think your loved one is in the beginning stages of hearing loss, here are some tips for preserving what hearing they have left. We all know that repeated loud noises are a common source for hearing loss, and damage becomes more apparent with age. Music that’s too loud, lawn mowers, leaf blowers, even motorcycles or other loud engines can make that damage even worse. If they are around a lot of loud noises, keep ear plugs to reduce the decibels to a comfortable level or even noise-reducing headphones they can wear over their ears can help. Sometimes, there isn’t any damage at all! Earwax can build up and cause clogs in anyone’s ears, but especially the elderly. Never put anything in their ear canals, especially cotton swabs, as they aren’t effective in cleaning earwax out of ears. Take them to their doctor and they can clean their ears out. The doctor can also let you both know if there is damage to their ear canal or ear drum. The elderly, just like children, are susceptible to ear infections and they can cause hearing loss. To help prevent ear infections, make sure everyone, like you, or a caretaker, wash their hands regularly. Sometimes ear infections piggyback with other illnesses, like a cold, so stay alert for ear pain or discharge if your loved one has a cold. Sometimes, medicines can cause hearing loss. If you think it may be a side effect of a medication, talk to their doctor about switching medicines or lowering the dose to prevent permanent hearing loss. This entry was posted on Friday, January 26th, 2018 at 12:21 pm. Both comments and pings are currently closed.